World of Warcraft Gold For Sale! Only you cannot spend it in-game. I saw this being advertised on the main World of Warcraft site and thought it had a ring of irony to it. Yes, actual, physical World of Warcraft coins. They’re probably easier to have around the house than, say, that Frostmourne replica you’ve been eyeing. But will it clash with my Anduril replica? And the coins are cheaper, too… as long as we’re not calculating by weight I suppose. For $60 you can get either the Alliance or the Horde coin sets. The product descriptions say it all. Whether looting dead mobs or completing a quest, now is the time to hold and horde solid precious metal coins from the game in your hand. All three coins included in this special World of Warcraft collectible set are plated in precious metals, and each coin features a Major Alliance Leader on one side and the leader’s corresponding city on the opposite side. The 24 karat gold-plated coin features the Human Military Leader of the Alliance: King Varian Wrynn of Stormwind and measures approximately 1.625″ in diameter. The sterling silver-plated coin features the Dwarven King: Magni Bronzebeard of Iron Forge and measures approximately 1.375″ in diameter. The copper-plated coin features the Night Elf High Priestess: Tyrande Whisperwind of Darnassus and measures approximately 1.25″ in diameter. All coins are approximately 0.125″ thick and are removable from the box. A non-removable commemorative metal plaque with the Alliance emblem is also included. Ready to be displayed on a desktop or wall, the set is presented in a black, hinged wooden box with a glass window and a flocked, vacu-formed tray. The box measures approximately 6.25″ wide x 3.25″ deep x .75″ high. The product is packed in a protective self-shipper. Limited Edition. Manufactured to order. Whether looting dead mobs or completing a quest, now is the time to hold and horde solid precious metal coins from the game in your hand. All three coins included in this special World of Warcraft collectible set are plated in precious metals, and each coin features a Major Horde Leader on one side and the leader’s corresponding city on the opposite side. The 24 karat gold-plated coin features the Orc Warchief: Thrall of Orgrimmar and measures approximately 1.625″ in diameter. The sterling silver-plated coin features the Forsaken Queen: Lady Sylvanas Windrunner of Undercity and measures approximately 1.375″ in diameter. And the copper-plated coin features the Tauren High Chieftain: Cairne Bloodhoof of Thunder Bluff and measures approximately 1.25″ in diameter. All coins are approximately 0.125″ thick and are removable from the box. A non-removable commemorative metal plaque with the Horde emblem is also included. Ready to be displayed on a desktop or wall, the set is presented in a black, hinged wooden box with a glass window and a flocked, vacu-formed tray. The box measures approximately 6.25″ wide x 3.25″ deep x .75″ high. The product is packed in a protective self-shipper. Limited Edition. Manufactured to order. Here is your opportunity to proclaim that you bought WoW gold while feeling no shame… or a different kind of shame in any case. Don’t get me wrong. Intellectually, I like the idea that you can buy all these WoW collectible items. I just can’t get as far as actually spending my own money on them. It is like reading the Sky Mall magazine on a flight; there is always interesting stuff, but how often do you actually buy any of it? Speaking of buying things… BlizzCon tickets have been on sale for 15 minutes now, so I suppose they have been sold out for the last 10 minutes. Sales of these collectibles will probably spike just on rebound purchases from disappointed fans. This entry was posted in Blizzard, entertainment, Humor, World of Warcraft and tagged BlizzCon on June 5, 2010 by Wilhelm Arcturus. LOL. You had me clicking this while screaming WTFAAA!!!? Such a tease Wilhelm. Good post though. Skymall reference was right on. 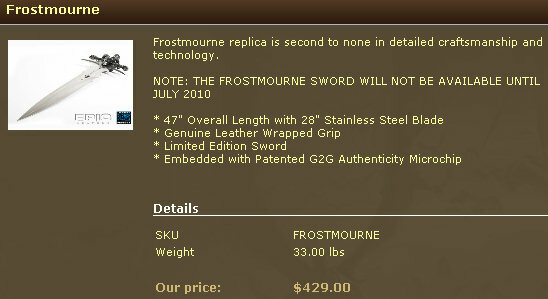 I’d buy out-of-game items like this for the Everquest franchise. Not at $60 a set though. At something nearer $20 they’d make great stocking-fillers. Leave out the “plated in precious metals” part. What I really want them to sell are player-race models with detachable armor and weapons so you can kit out a replica of your favorite character. I see, logging in with another computer, that WordPress.com decided this post would be a good one to which to attach some Ads by Google. If you see those, I have no control over them nor to I get any payment from them, they are all controlled by WordPress.com. I don’t even see those ads if I am logged into WordPress.com. I was wondering how a post with a headline like that might impact the site. Now I know! Oh, and Tauren chieftain on the COPPER coin!? I call racism!! @PeterD – Right up there with those carved wooden cigar store Taurens! Agree with Bhagpuss. A lot prefer they sell race characters.